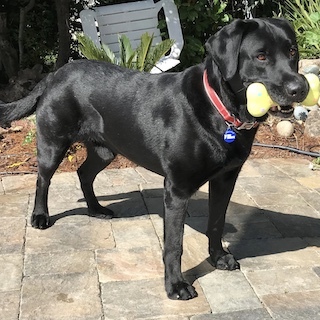 Background: Cooper joined Lab Rescue after a brief (two-month) stint in a temporary home after he was retired as a reputable breeder dog out in the central valley. This card-carrying AKC dog sired a number of litters but his breeding days are behind him now and he is looking forward to a forever home where he can romp, relax and hang inside with his peeps. His former life was mostly spent outdoors and he received little leash training. His breeder did socialize him well with people including children. What Cooper’s Foster says: A big and goofy blockhead! Cooper shows his affection by licking you to death and leaning into you for chin-scratches and belly rubs. So far he has not appreciated being crated or left alone, so we’ve teamed him up with our own Lab and they do great together. Cooper sleeps pretty darn good through the night in an office downstairs alongside our own dog. Cooper does enjoy relaxing in his own crate during the day after walks and playing. When you grab a leash, he is all in… bouncy, bouncy, bouncy in front of the door! Leash walks are a grand adventure as he is pulling all over the place… sniff, pee, sniff, pee, sniff, eat, pee – we’ve been using a Sensation harness to manage him on walks but this is gonna take some work. 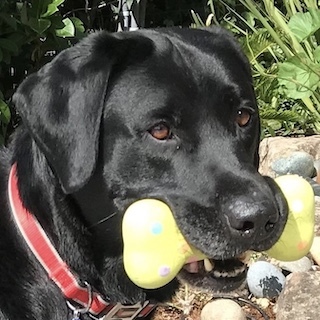 He is a novice fetcher – he will run after the ball and bring it back, sort of, and maybe drop it, sort of… and then become distracted, maybe. Not so interested in treats, hmmm, so our work on “sit”, “stay”, etc. is coming along slowly. 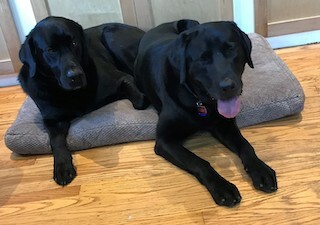 He loves hanging out with our own big Lab Diesel… and we are waiting for the big-dog live WWE action to begin (Diesel takes a while to warm up to new fosters). Still working on that house-broken stuff – he peed on Diesel’s bed in his first few hours in the house – DOAH! – but has not pumped bilges in the house since. Not sure how Cooper is around water or off-leash in the great outdoors—we will find out soon. 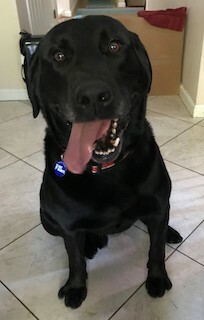 What Cooper’s Rescue Rep says: One stunning English Lab! A bit of a bull in a china shop right now as he has few manners and lots of energy – pretty rambunctious for being almost eight years old – he must be making up for lost time. He would be great with another large adult dog. Probably too much to handle for a family with small kids. No idea how he is with cats. He is all of 87 lbs… and there ain’t much fat on this guy. Better bring your best game to take on this awesome Lab. 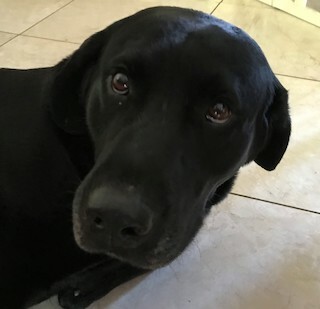 Medical Information: Cooper is in great health except for a likely torn ligament in his rear left leg along with some arthritis; does not slow him down though. He is current on vaccinations, microchipped, and heartworm negative. Just got neutered. Cooper is located in: Berkeley.